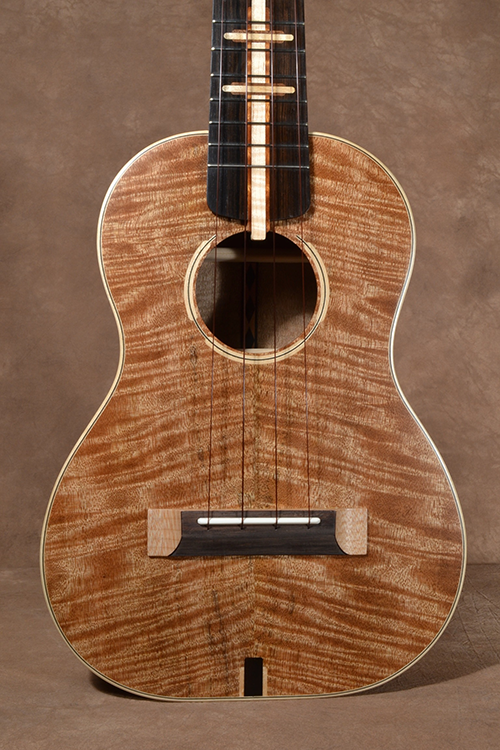 This elegant and meticulously crafted Tenor size ukulele is another in the Art Deco Style which I am fond of working in. 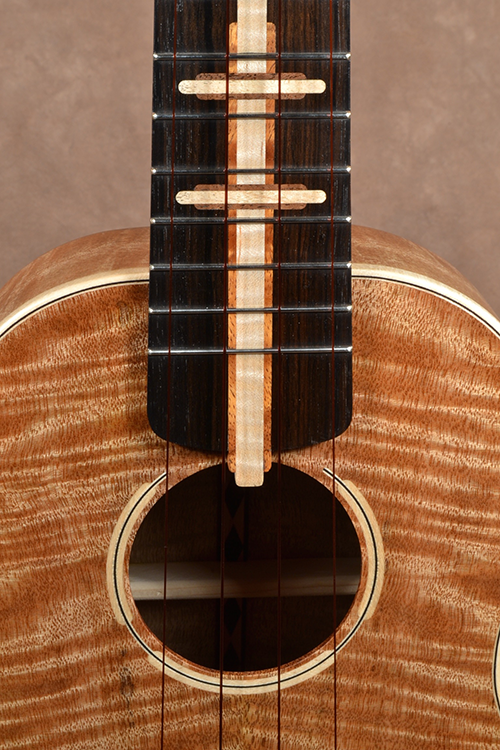 For starters it is a fabulous Pohaku instrument with every aspect of the building process from wood choices to excellent craftsmanship to the final finishing being second to none. As with all Pohaku instruments you’ll get an instrument which sounds better than it should, looks great, has a flat top, a curved backside and a long life. Having lived in Hawaii and working with most of the local island woods I normally wouldn’t pick Mango to build an instrument with but one of my Hawaiian Big Island wood suppliers sent me this gorgeous set. This instrument has sonic characteristics similar to a spruce instrument where it doesn’t accentuate the high notes as much as pronouncing the warmth of the mid-ranges. It’s finished silky smooth with a satin lacquer finish. The clean dark black Ebony fingerboard displays a wealth of the Art Deco accents inlaid in various woods. The other inlaid accents span from the deco tulip peg head down to the end graft on the body and onto the back. The set up, fret work, intonation and playability are all addressed with the finest attention to detail. As is the whole instrument. The tuners are the 4:1 ratio Peghead Brand tuners for smooth tuning and lightweight good looks. It will come in a custom Pohaku hardshell case. It’s weight is approximately 22 ozs and it is approximately 26 1/2” long.